IT WAS LIKE a scene from Charlie and the Chocolate Factory. Those lucky enough to have secured seats grasped their booking references tightly like golden tickets. The Willy Wonka of scepticism, the Evel Knievel of debunking, James ‘The Amazing’ Randi was in town. When it was announced that Skeptic magazine, in collaboration with Skeptics in The Pub, were organizing ‘An Evening with James Randi and Friends’, the five hundred or so available tickets sold out in a matter of days. Described by some as the founding father of modern day scepticism, Randi, the former escapologist and magician, has done more than anyone else to expose charlatanry and pseudo-science. He has authored devastating critiques of Uri Geller, evangelical faith healers and the writings of Nostradamus, as well as writing the seminal Flim-Flam!, Psychics, ESP, Unicorns and Other Delusions. His longstanding offer of a million dollars to anyone who can demonstrate paranormal abilities under controlled conditions remains unclaimed. 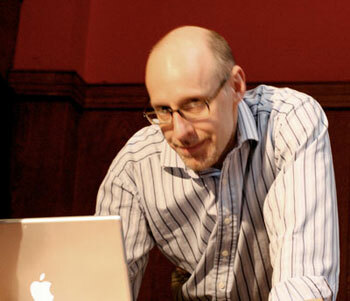 Richard Wiseman is Professor of the Public Understanding of Psychology at the University of Hertfordshire in the United Kingdom, as well as a fellow of the Committee for Skeptical Inquiry. 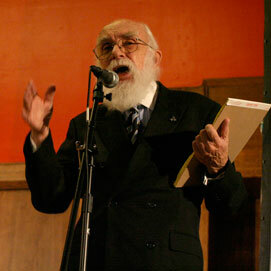 Randi doesn’t get to the UK often so, when his visit was announced, the organizers of the event decided on Conway Hall as a suitably sized venue. The unassuming building nestles in a quiet London square and is home to the South Place Ethical Society as well as the recently inaugurated London branch of the Center for Inquiry. The first speaker was Professor Chris French. As well as being head of the Anomalistic Psychology Research Unit (APRU) at Goldsmiths College, London (and co-editor of this publication), he is also a leading sceptical figure in the UK media and is the “go-to guy” when a sceptical perspective is required on a TV or radio show on the paranormal. Professor French spoke about the growth of scepticism in the UK (helped in no small part by groups such as Skeptics in the Pub who have steadily seen their numbers rising) as well as describing the work of his research unit. The APRU focuses on finding non-paranormal explanations for ostensibly paranormal experiences. This is a highly important direction for research as it is one thing to simply deny paranormal claims, but a far more potent response is to show evidence for prosaic explanations of the causes of paranormal experiences. The more we understand about ourselves, the less need there will be to resort to supernaturalism to explain the stranger end of human experience. Simon Singh followed. One of the UK’s most successful science authors, his books Fermat’s Last Theorem, The Code Book and Big Bang have sold in large numbers and have paved the way for a slew of popular science books. Dr Singh spoke about the beauty of the scientific method and then in what must have been one of the evening’s most memorable moments, he demonstrated the signature orange light emitted by sodium atoms by connecting a gherkin to the mains! Singh’s new book Trick Or Treatment? Alternative Medicine On Trial (co-authored with Edzard Ernst, the world’s first Professor of Complementary Medicine) has just been published and is a rigorous and uncompromising assessment of the evidence for and against alternative medicine. Next to the stage was Ben Goldacre who must surely have the gift of manipulating space-time itself. How else could anyone manage a full-time career as a medical doctor as well as be such a prolific blogger and journalist? (Goldacre’s column in The Guardian is always excellent.) A technical hitch meant that the slide presentation didn’t work, but we were still treated to a superb talk on the power of the placebo effect. Apparently studies have shown that four sugar pills are more effective than two, and the colour of pills and their packaging can impact on effectiveness, and, perhaps most remarkably, drugs which normally induce nausea are seen to reduce sickness in pregnant women when they are told that the drug is an anti-nausea medication. This suggests that in some cases, the placebo effect is powerful enough to act in opposition to the known pharmacological effects of substances! The final guest speaker before Randi was Dr Susan Blackmore. Years studying parapsychology in the belief that proof of the existence of ESP was there to be found established Blackmore as a leading figure in British parapsychology. With typical impassioned delivery, Dr Blackmore recounted her story. A life changing out-of-body experience whilst a student at Oxford sparked her interest in the paranormal and prompted her to pursue a PhD in parapsychology, but eventually a lack of positive results, as well as the discovery that researchers at Cambridge were obtaining such results by cheating, led Blackmore to become a sceptic. One might think that someone who started off earnestly searching for proof of the paranormal but changed her mind in the face of the evidence (or lack thereof) might be respected for having the strength of character to admit a mistake. But for Blackmore this was not the case. She spoke of receiving vindictive hate-mail from believers accusing her of being closed minded (the irony of this obviously having escaped the authors of such communications). A few years ago Dr Blackmore withdrew from public scepticism, but her recent debate with theologian Alister McGrath (she completely demolished him), as well as comments made during the Randi evening suggest that she may be returning to the fold. This could be very good news for the sceptical community! By now the anticipation was palpable. After a brief introduction and a video retrospective on Randi, the man himself walked onto the stage. It’s hard to describe the feeling in the room at that point. The thunderous applause conveyed the profound respect and gratitude that the audience felt towards Randi. He has dedicated his entire life to fighting the spread of irrational beliefs, not just because he knows he’s right, but more importantly, because he knows that genuine suffering follows all too often as a consequence of accepting extraordinary claims without extraordinary evidence. Randi began by speaking about his biography currently being written by Penn Jillette, entitled I am James Randi and I will Die Today. The title comes from the days when, as a professional mentalist, Randi would each day write this sentence on the back of a business card along with his signature and the date and carry it with him, just in case. He says the difference between a stage magician (or conjuror) and a self-proclaimed psychic is that the magician has an unspoken agreement with his audience. He will lie, cheat and generally employ all manner of deception in order to fool them; but this is part of the act. He is doing it purely for the benefit of their entertainment. Once the show is over, so too is the deception. The JREF Million dollar offer will be ending in 2010. Currently, applicants for the prize are asked to answer three simple questions: What can they do? With what accuracy, and under what conditions? This would seem to be the most straightforward of requests, but Randi points out that 85% of claimants never get as far as even answering these initial questions. He explained that once the challenge is withdrawn, the million dollars would be used to fund scholarships and research projects. Randi spoke about the methodology in his test designs. The idea, he said, is to leave no room for interpretation or argument. The tests should be designed so as to negate the need for judgment of any kind. As an example, we heard of a test recently conducted in Japan where a man was claiming that his spirit guides could tell him the contents of sealed envelopes. One method of testing would be to have the man guess at what was in a selection of sealed envelopes but this, according to Randi is not the best approach. What if the envelope contains a picture of a bicycle and the man guesses “motorbike”? Is that a hit or a miss? How about car or train? This method requires a subjective choice to be made about what constitutes a positive or negative result. Randi’s test involved the man having to match up twenty different pictures to envelopes containing copies of those pictures, thereby neatly sidestepping the issue of what should count as a hit. It’s a quantum affair: The picture either matches what’s in the envelope or it doesn’t! In the case of the Japanese remote viewer, the claimant said that he expected to get at least seventeen out of twenty right. In fact he scored at chance level, successfully matching only one picture to the correct envelope. Randi pointed out that any complaints of unfair testing are unfounded as claimants are simply being asked to do what they themselves claim they can do. At one point, Randi suddenly walked away from the microphone he had been speaking into the whole time, but his voice continued to come from the speakers loud and clear. In fact the microphone was not even plugged in (he was using a lapel microphone). He then also revealed that his glasses were in fact just empty frames with no glass. All this to illustrate his point that we tend to think that we can rely on our assumptions and are beyond being fooled. The audience was treated to video clips of Randi exposing Peter Popoff and psychic surgeons but perhaps the most poignant moment in Randi’s presentation was his discussion of fellowship amongst sceptics. He underlined how important it is to build sceptical communities where people can come together with a common sense of purpose. This definitely struck a chord as many sceptics have had the experience of feeling isolated as a result of their views. Needless to say, Randi’s talk was followed by a standing ovation. Jon Cohen is a successful record producer. However, his main passion is scepticism, which he discovered after reading Sagan’s The Demon Haunted World in his early twenties. In 2008, he offered Psychic Surgeon Gary Mannion £50,000 if he could prove his abilities under controlled conditions.